ALL RUNNERS MUST TAKE THE BUSES TO THE START OF BOTH RACES. THE CITY HAS ENSURED US THAT TOW TRUCKS WILL BE TOWING ANY AND ALL CARS PARKED ON THE SIDE OF THE ROAD OR ALONG THE COURSE. Buses will be lined up on East Main Street between Bozeman Ave and Rouse Ave at 8:30am for the half marathon race. At 9:25 buses will arrive to load 10K runners. Please park in the downtown parking garage located on North Black, one block from the finish. Do not be late, as the buses will not wait for you. Race day packet pickup for those runners driving to Bozeman the morning of the race from 8am - 9am, please note that race day packet pickup is only meant for those runners traveling from out of town. Race day packet pickup will also be held at the fairgrounds. - We are offering chip timing this year, with the ChronoTrack B-tag. When you pick up your bib number, the paper B-tag timing chip will already be attached to it. Each participant must wear race bib. - The bib number pinned to the FRONT of whatever garment you will be wearing at the Finish Line. The Half Marathon course will start on Patterson Road heading west and loop south in order to catch the 10K course for the finish. The 10K starts at Cambridge Dr. and South 3rd Ave., heads to Goldenstein, links up with Sourdough and finishes steps away from the Pub 317 at 321 East Main St. It is mostly downhill. The entire race is on roads. 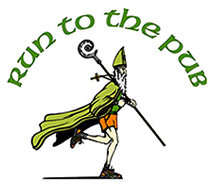 Awards & Goodies: There will be music playing at in the finish area and cold beer will be pouring at Pub 317 (for those of age). The four winners of the Dublin Marathon trip will be announced following the race.